On January 2, 2018, my wife burst through our apartment door. She was hyperventilating and weeping. After a Christmas season populated by pets and trees (the mortal enemies of an asthmatic with allergies), she’d been having trouble breathing and finally went to the doctor to get it checked out. When she was sent for a chest X-ray, she noticed all the signs around the office: “If you think you might be pregnant, let us know.” We’d been trying for our first baby for a few months at this point, after moving an hour outside of Toronto to find something quieter, slower. We’d been in the same room for two pregnancy tests, hoping to experience that joyful moment together, but no luck. Instead, my wife found out in the bathroom of an X-ray clinic, because sometimes that’s how life goes. She ran home, breathing issues be damned, and we hugged and cried. All the clichés are true. I don’t want to oversell my anxiety. I didn’t necessarily doubt my readiness, but with nothing to do but wait and attend doctor’s appointments for the next few months, that leaves a lot of time for very distinct, specific worries, both big and small, to set in. Could I be a good role model? Would a baby change the wonderful, supportive, loving dynamic that’s defined my relationship with my wife for nearly 10 years? Was our apartment decluttered enough to welcome a new life? How do you wash a tiny human? 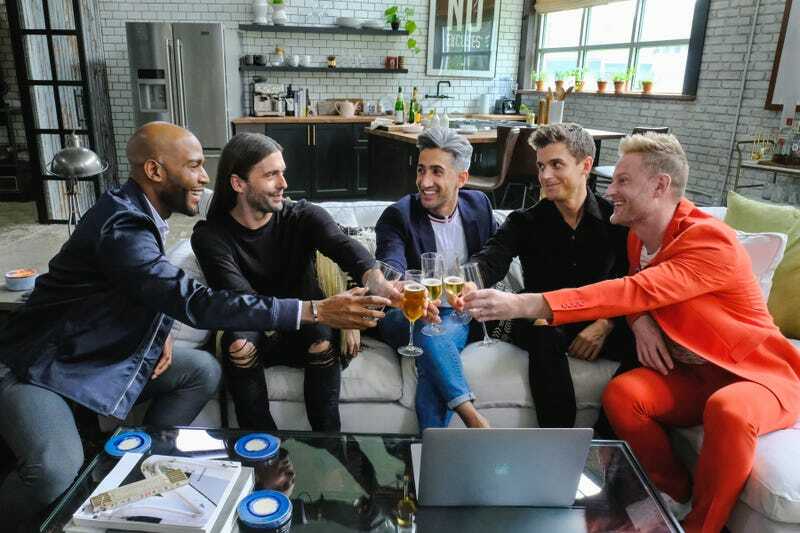 Then, on February 7, Netflix dropped its rebooted version of Queer Eye For The Straight Guy—retitled Queer Eye in a show of the brevity that Netflix affords its show’s titles, but not their opening credits. I have no particular, strong feelings about the original incarnation. It was a phenomenon when I was growing up, and I’d caught an episode here and there with my parents. Nevertheless, the new version seemed like exactly what I needed in that moment: After the end-of-year rush to catch up with all the critically acclaimed TV shows of 2017, I needed something to just unwind with for a few days, especially during the lull in TV premieres during the 2018 Winter Olympics. I expected to watch something entertaining, but also something I wouldn’t have to think much about late at night after I’d finished my work. What I found was completely unexpected: a salve for my anxieties about what kind of stay-at-home father I would be, and a surprisingly impactful message about what it means to be a man in this day and age. I saw reflections of my insecurities in nearly all of the men the Fab Five were making over. I felt for Tom, an older man with a ton of spirit and a love of Mexican food, who tells the Five when they show up that “you can’t fix ugly,” his words reminding me of ones I’ve uttered about my own body. Neal’s use of jokes and sarcasm to deflect true emotion felt relatable, even if I couldn’t imagine living in his dog-hair-infested apartment. “Below Average Joe” and his fear of failure rings true to anyone who’s tried to make a living off of a creative pursuit, and his need to pull whatever shirt he was wearing away from his body just another tic I recognized in myself. Men, and I’m largely talking about straight men here, are grappling with new ways of living, new responsibilities, and new ways of understanding themselves. You can see the positive change, like the slow shift in men taking on more responsibility at home or understanding they don’t have to accept certain traditional roles, like being the breadwinner of the family. But there’s also the dark side of that shift; the connection between domestic violence, mass shootings, and a culture that still demands men act a certain way, and that they suppress feelings to the contrary, is pretty clear. The eight episodes that make up the first season of Queer Eye are certainly not a glowing example of politically challenging television, no matter how much some of the material might call for it. The show walks up to difficult conversations, only to step back. The “common ground” message of the third episode, which features an incredibly uncomfortable segment where Karamo, a black man and the Fab Five’s culture guru, is pulled over by a subject’s nominator (both the subject and his nominator are cops), is shockingly tone deaf. It’s also followed up by a lengthy car ride dominated by an idealistic bit of “both sides” talk that fails to get at the reality of racialized police violence in America. Karamo, teary-eyed, talking about his son being afraid to get a driver’s license because of potential interactions with cops is simply not the same as Cory’s frustration at being lumped in with bad cops. Where the show falters politically, it succeeds in tackling issues that face men more broadly. If the crisis is masculinity and its toxic effects—the suppression of emotion both positive and negative, the pressure to fill a certain role, to look a certain way, to act a certain way—then Queer Eye has the beginnings of a remedy. Its message of self-love, self-care, and self-confidence should be inspiring for all men. As I watched and then unashamedly re-watched the episodes, I found a renewed confidence as a partner and an expecting father. What’s so remarkable about Queer Eye is that it simply gives men permission to be whatever they need to be. It challenges the idea that men’s needs or interests when it comes to fashion, grooming, cooking, mental health, and self-care are second to anyone else’s, instead laying out how a lot of self-love can have a tremendous positive impact on your relationships. What I found as an expecting father specifically, though, was something I desperately needed: hope. Hope that a world filled with kindness and empathy not only exists, but can be actively created in small steps by people looking to do a little bit better every day. Perhaps I could create a home filled with love and understanding that, in some small way, would contribute to a better world. Perhaps I could lead by example. The most inspiring thing about the eight episodes of Queer Eye isn’t the surface makeovers, but rather the internal ones. You can feel the weight leave the shoulders of many of these men as they’re given permission to be vulnerable for once. Our culture often doesn’t allow that, which makes the emotional revelations in Queer Eye all the more profound. It’s incredibly healing to watch a father of six talk about feeling overwhelmed by his responsibilities. It’s comforting to see an older man talk about the insecurities he has about his looks and his body, a reminder that behind the culturally approved tough exterior, just about everyone is suffering. But Queer Eye doesn’t wallow, and that’s perhaps its most significant trait. As I finished watching the series for the second time, I felt ready for the changes that were about to come into my life. Queer Eye, with its message of self-love and eternal optimism, gave me a sense of confidence that I didn’t even know I needed or had access to. With its radical empathy, the show states that we are in control of our own little pockets of the world. Our impact, as men, fathers, partners, and allies, is immense. That’s nothing to be scared of. It’s something to get excited about.